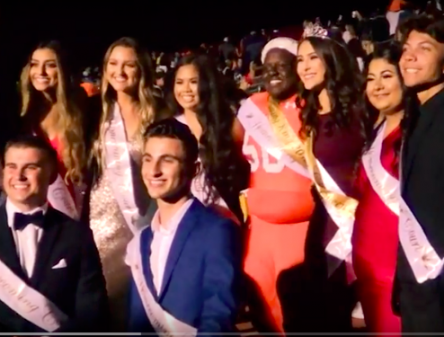 EL CAJON – Valhalla High senior SHAWN MWANGI had no time for the fireworks going on behind him after being named Homecoming King during halftime on Friday night. Mwangi, while graciously getting to share the spotlight with Homecoming Queen SANDY MCKANY, was ready to be concerned with the explosive Eastlake offense and talented sophomore quarterback RICH COLEMENERO III. Near the conclusion of the pomp and circumstance, Mwangi turned to members of his team who had gathered around the royal couple. Despite a 42-0 deficit on the scoreboard, Mwangi shouted out words of encouragement like a man instructing a team during a tied game at halftime. No wonder the team captain and nose guard is revered by his classmates. And While the hosts’ well-scripted halftime festivities went off without a hitch, it was “Game On” from the outset for the seventh-ranked Titans, who won 52-0. Eastlake (4-1) scored on its first drive, taking 4:10 of the clock, with an 8-yard touchdown pass to Darius De Los Reyes from Colmenero. After a penalty moved the ball up for the ensuing kickoff, the Titans caught the Norsemen napping with an onside kick recovery. On the drive, Eastlake picked up on fourth-down conversion on a pass to Sebastian Scholl from Colmenero to the 1. Scholl would get the honors on the next play from his slot position for the score. The Titans scored on the next series when senior AJ Hernandez had a 35-yard run down to the Valhalla 7. Then, senior Kevin Bateman made a superb leaping catch in the back of the end zone a three-score lead just 8:34 into the game. After a short Norse drive, Eastlake needed just one play to score for the fourth time in the opening quarter. De Los Reyes hauled in a long pass down the middle of the field from Colmenero for an 80-yard score with 52 seconds left in the first. De Los Reyes had a 50-yard punt return to set up a 9-yard touchdown fun by Hernandez. Adrian Hinojosa added another score with just over five minutes to go in the second quarter, the Titans sixth touchdown of the half. Junior Mateo La scored the only touchdown of the second half. Valhalla got a combined sack in the first half from Connor Nagel and Zach Larson. Junior Kegan Baker had a 15-yard run for a first down in the second quarter for the Norsemen. Sophomore Luke Pillsbury completed a pass to senior Karon Jones in the first quarter for Valhalla.